Are you thinking of investing in a memory foam pillow but worried that it may feel too hot? Do you need some tension relief for your neck or shoulders? If so, then a gel pillow could be the solution you need. Our favorite gel pillow is the Z Shredded Gel-infused Memory Foam Pillow, made with small pieces of foam to promote airflow and cooling gel beds for a cool sleep. Our second favorite pick is the ViscoSoft Arctic Gel Contour Pillow, which has a curved shape for targeted neck support and comfort. Wading through all of the information on pillows out there can be a daunting task. In this article, we’ll cover the 7 best gel pillows on the market, along with the benefits of using one, and things to keep in mind before you buy. If you’re looking for a gel pillow not just for some additional comfort and cooling but for targeted neck support, you might appreciate the ViscoSoft Arctic Gel Contour Pillow. 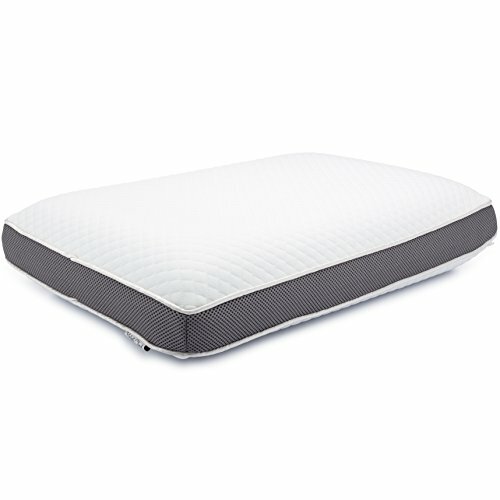 This product uses soft, yet supportive memory foam and has a contoured shape. This curved design cradles your head and keeps your neck supported to relieve pain and tension. The pillow uses WaveFlow gel and a cool, breathable cover to keep sleepers resting at a comfortable temperature. ViscoSoft has a 30-day return policy that allows you to request a refund if you aren’t satisfied with your pillow for some reason. The product is backed by a three-year warranty that covers manufacturing defects. 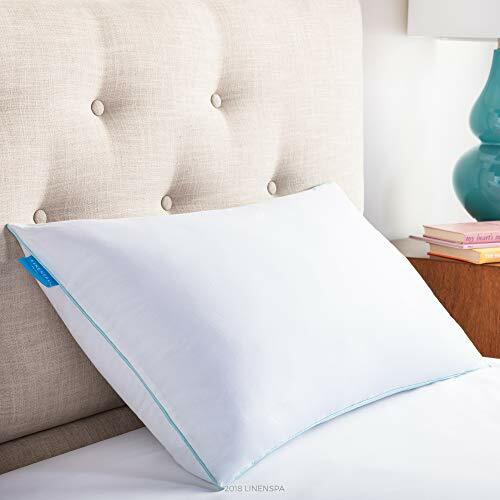 The LinenSpa shredded memory foam pillow has a memory foam core and an outer layer made with gel foam. It has a medium-firm feel, which should work for a wide variety of sleepers. You can move and shape the shredded foam to fit your unique preferences. It also has an affordable price, compared to other gel memory foam pillows. This pillow is 6-inches thick and conforms to your neck and shoulders for pressure relief. It has a heavy design that helps it stay in place and support you all night long. The cover is made with 250 thread count cotton, has a soft feel, and can be removed for machine washing. This product comes with a three-year warranty. This gel pillow by Sleep Innovations has a reversible design that offers two sleep surfaces in one. One side is made with gel-infused memory foam that keeps you cool, while the other is just ordinary memory foam without cooling gel. The foam used in this pillow molds to your body’s unique curves to help your spine stay properly aligned. The pillow is 5-inches high and has a soft, removable cover you can throw in the washing machine. It comes with a five-year limited warranty. The Perfect Cloud Gel Pillow cradles you to sleep and has two different sides with varying coolness options. One side has a gel layer and the other is the brand’s signature memory foam, making this pillow suitable for every season. Hypoallergenic to protect sleepers against dust mites and mold, this pillow comes with ventilation holes to further promote cooling. The cover has a soft knit design and can be machine washed. The Perfect Cloud Gel Pillow may conform quicker than other memory foam designs which means it’s comfortable immediately. The level of comfort offered by the Perfect Cloud Dual Option Pillow can potentially ease tension in the neck and shoulders. If you sit at a computer every day, switching to this pillow could help you recover. Finding the right pillow can be a bit tricky as a side sleeper because you’ll need just the right amount of firmness and a low enough profile to keep your neck aligned in this position. Too soft a pillow can allow your head to sink in too far, making it hard to breathe and potentially causing pain. 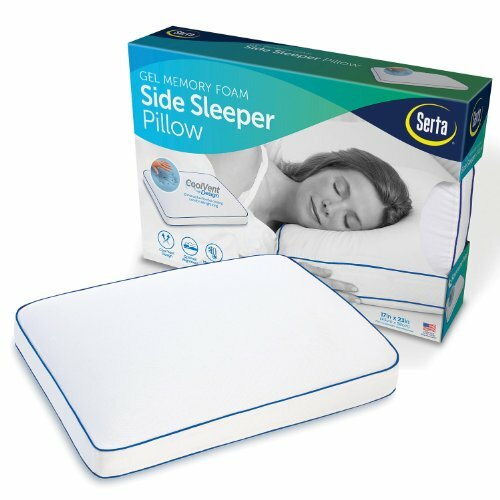 The Serta Gel Memory Foam Side Sleeper Pillow was designed to support side sleepers with a firm and low profile. It also offers a vented design for enhanced airflow and a cool sleeping experience. It has a gel memory foam core that helps prevent heat from building up and a removable, washable cover. The design of the Serta Gel Side Sleeper Pillow also works well for back sleepers and the low profile should properly and comfortably support the neck in this position. The product comes with a five-year limited warranty. If you prefer a thicker pillow, you might want to consider the PharMeDoc Memory Foam Pillow with Cooling Gel. It has a plush design made with medium-density foam and allows you to choose between an ordinary memory foam side and a side with cooling gel. It has a hypoallergenic design, so if you suffer from a down allergy, this could be a potential solution for you. This pillow adapts to your neck and head, relieving pressure points and easing tension throughout the night. The cover on the PharMeDoc Gel Pillow comes off for easy washing and the pillow comes with a seven-year warranty. The Z Shredded Gel-infused Memory Foam Pillow uses heat-dispersing gel beads and comfortable foam to give you a cool sleeping surface. The shredded foam pieces are not only breathable but moldable, so you can adjust the pillow to the shape you prefer. This pillow comes with a Tencel™ (a soft, natural cellulose fiber) cover that is breathable and moisture-wicking. 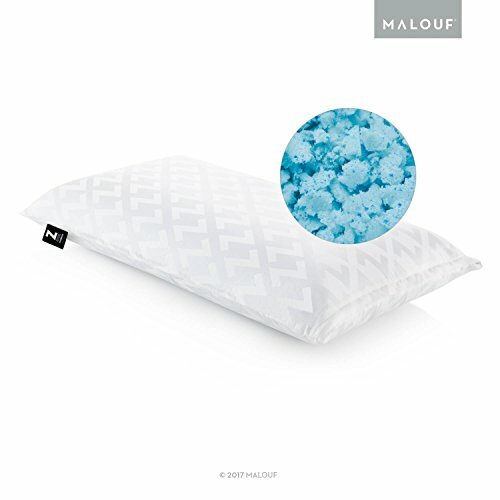 The shredded foam in this pillow promotes airflow and is encased in a memory foam “Gel Dough” sleeve that creates a smooth surface. The Z Shredded Gel-infused Memory Foam Pillow has a medium-firm feel and comes with a three-year warranty. What Is A Gel Pillow? A gel pillow is a memory foam pillow with a layer of cooling gel added. Memory foam is a conforming material that responds to body heat, contouring around your body to produce pressure-relieving comfort. Many users have reported pain relief and improvements in their quality of sleep after switching to memory foam. But the material can come with a drawback; retaining too much heat and feeling too warm. By adding a gel layer to their products, manufacturers can ensure that you sleep cooler as the material disperses your body heat. These products also typically include a cool, breathable cover to help with temperature regulation. The type of gel used will depend on the manufacturer and most companies have proprietary products for this. Potential pain relief: Memory foam pillows contour around your neck and head, allowing the weight to be distributed evenly. A gel pillow allows you to receive this benefit without overheating in the night and waking up sweaty. Falling asleep faster: When you’re at a comfortable temperature (which is between 60 and 68 degrees F for sleeping), falling asleep can happen much quicker. Some people naturally sleep hotter than others, which makes special cooling technology all the more important for them. Staying asleep: Not only does a comfortable resting temperature allow you to drop off to sleep fast, but it also allows you to stay deeply asleep. A gel pillow will pull your body heat away from you, preventing you from getting too hot and keeping you comfortable as you rest. Having more energy throughout the day: Getting poor sleep night after night can have detrimental effects on your mental health. You may feel stressed out more easily and sapped of energy. 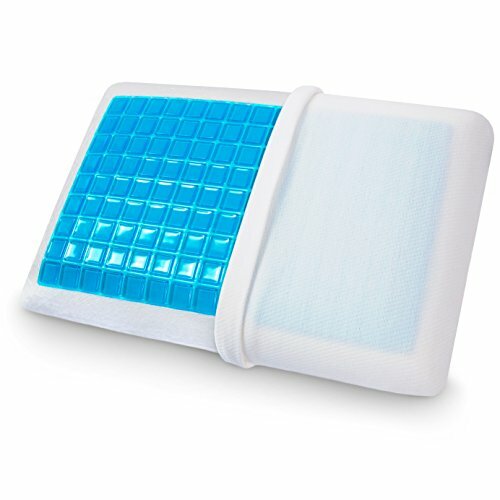 By taking steps to rest cooler at night with a gel pillow, you could find that you have more energy throughout the day. Some sleepers sleep exclusively on their back, while others sleep on just their stomach or just their side. Then there are people who switch between these positions (combination sleepers). The right type of pillow for you depends on what your favored sleep position is. If you sleep on your stomach, you’ll be better off with a flat pillow, so your neck and back aren’t strained. Side sleepers should use a firm pillow to ensure their head is propped up enough, while back sleepers may do best with a medium-firm pillow for proper neck support. A medium-firm pillow will also work for combination sleepers. There are a few different types of gel pillows available on the market. While some are made from a single piece of foam, others are made with “shredded” foam. Shredded memory foam pillows are made with many small pieces of foam instead of one solid piece, which makes the pillow fluffier and more moldable. Shredded foam also promotes airflow more than solid foam pillows. Some gel pillows have layers of gel along the interior and others use gel layers on the surface. Some have removable gel layers while others are fused to the pillow. A memory foam pillow may be infused with gel swirls or beads for cooling, instead of or in addition to gel layers. Gel pillows come in all shapes and sizes. While the options that look and function like ordinary pillows are simple enough to use without extra explanation, other types need extra consideration. If you’re using a curved memory foam pillow, the flat side should be facing down. The larger curve should be closer to your shoulders while the smaller curve should be on top of your head as you lie down. By using your pillow properly, you’ll get the most out of it. While memory foam pillows can cost as little as $12, gel memory foam pillows tend to cost around $40 to $50 on average. You’ll have to think about whether you’re willing to spend this before you decide on a gel pillow. Before choosing a new gel pillow, you should read over the warranty that comes with it. This will vary based on the quality of the product, the manufacturer, and more. You’ll find a variety of firmness options for gel pillows. Some even allow you to adjust the firmness by adding or removing filling. The firmness level you should choose will depend on your personal preference. Again, stomach sleepers will do well with a softer pillow, side sleepers a firmer pillow, and back sleepers medium-firm. Traditional: Some gel pillows look and function a lot like an ordinary, traditional pillow in shape and size. These may work well for people who want to switch to a more comfortable pillow but don’t have specific support needs that a unique pillow shape can provide. Convoluted: A convoluted pillow has an egg crate-shaped design that promotes airflow. While gel layers or infusions can improve your pillow temperature, a convoluted design will enhance it even more and keep you cool. This design may be suitable for people who have serious struggles with getting too hot in their sleep. Curved: A curved gel pillow is the previously mentioned style that includes two curves and a dip in the center. If your neck needs some attention and special support, this could be the right design for you. Keep in mind that memory foam can be slow-responding and may also take a while to break in after you buy it. If your pillow feels too firm, give it a few minutes to conform to your neck and head and also give yourself some time to adjust to using a new type of pillow. Many memory foam pillows will need a break-in period of a few days or weeks before they feel truly comfortable. 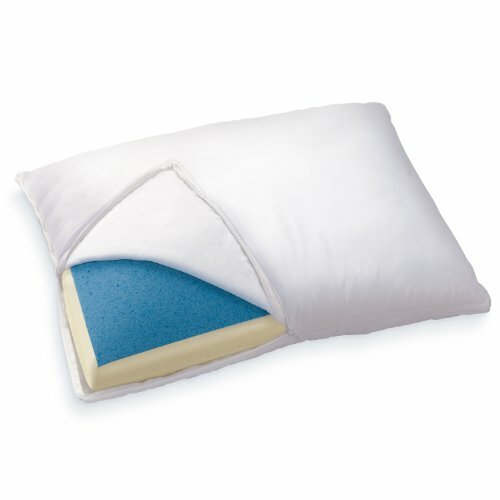 While users report that their pillow felt very hard initially and softened over time. To help this process, try to sleep in the position you sleep in most often during the break-in period. Q: Do I need an additional pillowcase with a gel pillow? A: Most gel pillows will come with their own removable cover that you can take off and throw in the washing machine. Some may prefer to use an additional cover over this to create a customized feel or just to make the pillow more sanitary. Q: How often should you replace your gel pillow? A: People who use an ordinary polyester pillow should replace it every six months. Memory foam and gel pillows, however, can last up to a few years or even longer, depending on the quality of materials used. The best way to tell when you need a new pillow is by noticing when it stops feeling as comfortable as it did before. Q: What does “fill” refer to with gel pillows? A: While some memory foam pillows are formed out of a single piece of foam, others have fiberfill or shredded foam. These types of pillows are more conforming and may have a plusher feel to them than those with a solid piece of foam. Some pillows even allow you to add or remove filling for a custom feel. Q: Are gel pillows suitable for pregnant women? A: Since sleeping hot is a common symptom in pregnancy, a gel pillow could help with this issue. One thing to keep in mind, though, is that some memory foam pillows come with an off-gassing odor. 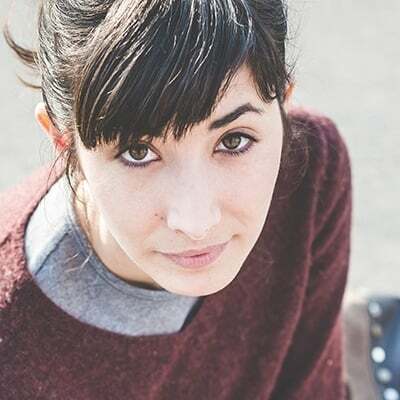 Since pregnant women are also sensitive to smells, this could bother some. Q: What else can I do to sleep cooler at night? A: While a gel-infused memory foam pillow can certainly help you keep your sleep temperature down, it’s far from the only thing you can do. You might want to consider getting a specific mattress designed for cool sleeping, like a gel-infused memory foam option. In addition, you can use a breathable material for your sheets, such as cotton. 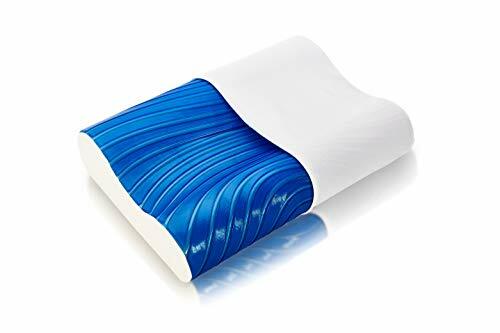 All in all, a gel memory foam pillow is a good option for people who need conforming pressure relief for their neck or shoulders but who have trouble with overheating at night. Getting breathable sheets and a cool-sleeping mattress will also be a huge help. The best overall gel pillow pick is the Z Shredded Gel-infused Memory Foam Pillow, due to its moldable function and breathable design. Zeopedic Mattress Review 2019: Is This Budget-Friendly Memory Foam Mattress Worth It? 7 Best Cooling Pillows: What is the best Cool Pillow?